Come and browse at your leisure through our extensive range of beautiful bridal gowns from the leading bridal houses of Europe, America and of course the United Kingdom. Should you require even more exclusivity, then following a personal consultation with Gwen, our team of seamstresses will create the exact gown of your dreams in whatever fabric you select. To compliment our bridal gowns, we also carry a large stock of bridesmaids dresses in a variety of complimentary colours and fabrics. Should you not find the one that quite suits your requirements, we can of course make the dress that does. We are also pleased to offer you bridal shoes from leading suppliers, in all styles and colours and produced in a selection of materials. We can even arrange to have shoes and handbags, hand crafted, from your own fabric. We also stock a large selection of veils, hats, head-dress, gloves, garters, stockings, tights etc. Finally we will even look after the groom for you, we can select everything he will need for the special day from our superb men's hire section. Where he can hire everything from shoes, ties and shirts to fabulous embroidered waistcoats and top hats. 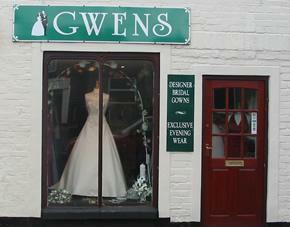 All Our Gowns are Available for Hire or Purchase. Gwens Where Your Dreams, Come True.